Communication is a pivotal tool used everyday in your association to foster and maintain valuable relationships. 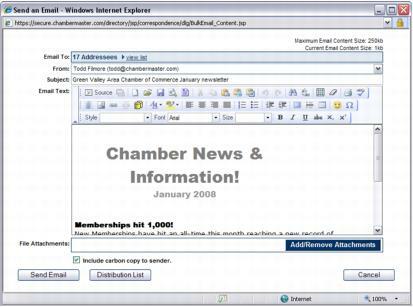 ChamberMaster/GrowthZone offers the ability to communicate via email, SMS text, fax and print. 12.6.3 Your domain may be "blacklisted"
A Public Disclaimer message may be configured to include on all Mass Emails or ALL Emails that are sent from ChamberMaster/MemberZone. Included in the disclaimer is a link that will give your members the option to un-subscribe from emails. Expand the Email Server Settings section and scroll to the Public Disclaimer. You may edit the message as desired, but the link to un-subscribe should not be altered. Add Public Disclaimer to all Emails - select this option if you want to include the disclaimer on ALL emails generated through ChamberMaster. This will include emails sent via Groups, Email to multiple members and individually sent emails. If no selection is made, then the public disclaimer will only be included on Mass emails. Allow Unsubscribe from ALL Emails - select this option if you wish to allow recipients to un-subscribe from both mass emails and individual emails. NOTE: This would un-subscribe them from emails sent for billing purposes. 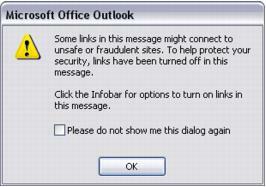 When a mass email is sent to a group, clicking the link in the public disclaimer will allow the recipient to continue to receive emails for the group, opt-out of the group emails (NOTE: If the group has been configured to dis-allow opt-outs, they will be prompted to contact your organization), or to join additional groups. A mass email (by definition an email sent to more than one person) may be sent through the communications tab, by selecting Email to Multiple Members, or it may be created when sending Event Invites, etc. The public disclaimer will be included on these emails, and the recipient will have the ability to opt-out of all mass emails, subscribe to other lists, or continue to receive emails. Note: The recipient would continue to receive emailed billing transactions and any other emails sent to them individually. If you have selected Allow Unsubscribe from ALL Emails and included the public disclaimer on all emails, the recipient will have the ability to un-subscribe from all email communication whether sent from a group, a mass email (such as event invitations) or individually. This will include billing related emails. NOTE: The Email Notifications (Additional Setting for Staff Admin) under Association Employees/Reps will be sent whether the member elects to unsubscribe from mass emails or all emails. The email sent to staff indicates what type of unsubscribe it was (Mass or All). Click the icon. A list of all the groups the member is subscribed to will be displayed. 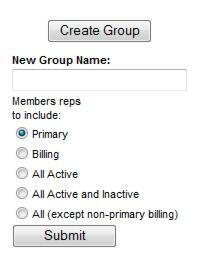 Deselect the check-box for the groups to which you wish to resubscribe the member. You can view a list of all members who have unsubscribed from emails, and resubscribe them from the Manage Unsubscribed Email report. Click Communications in the left-hand menu. Click Manage Unsubscribed Emails in the Monitor and Manage Communication section. Click the Manage Subscriptions button. Enter any part of First Name, Last Name or Email Address of the Rep to re-subscribe. The system will search for and find the appropriate rep.
A list of the the groups the rep belongs to will be displayed allowing you to resubscribe. If a member calls in and asks to be removed from all emails, you can now enter the opt-out selection for them. Access Communication ➝ Manage Unsubscribed Emails and select Manage Subscriptions. You may also opt a member BACK-IN if they desire. Also available under that selection you'll find a list of all unsubscribed email addresses where you may click the email address and deselect the Opt-Out checkbox for any selection where the email address should be re-subscribed (a feature that has been available for quite some time already). In Outlook (or whatever email program you use), include your association's unique archive address as a BCC. The software will receive the email, and look at the address sent/replied to and place it on the communication history of the associated member. Emails with addresses that are not recognized will still be archived but placed under Communication -> Manage Unmatched Archive Emails where you can go to view and manually match them to the appropriate member. To use the archive feature, you must be sending the email from an email address that is listed as a staff email address under Setup -> Employee/Reps. Emails forwarded or cc'd to archive@youraname when multiple members/reps in your database share the same recipient address will be recorded in Communication --> Unmatched Archive Emails. 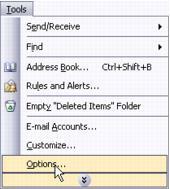 Once email recipients are selected in ChamberMaster/GrowthZone, there are two methods of sending the email. Using ChamberMaster/GrowthZone's built in email tool. Using Microsoft Outlook (if installed on your computer). Depending on your needs, you may choose to send some email directly from ChamberMaster/GrowthZone and some from Microsoft Outlook. Each method has its own strengths. Both methods of sending email will record in the Communication History. See Recording Communication History for more information. Note: This selection will open whatever the email program is set as the default for your web browser. Whatever email program opens when you click on a “mailto” link is the email program that will be used when you click Email with Outlook. Locate one of the screens mentioned in Communication Basics and click the email selection. If sending from the Communication module using New Email to Multiple Members or Form Letters, you will need to select the desired recipients first</span>. Create the email and click Send Email Now or Send Email Later (Available only for those with Plus or greater edition). ChamberMaster will send the email immediately or at the scheduled time and record it on the Communication tab of the member’s record. Note: All emails sent from ChamberMaster/MemberZone are sent BCC to the recipients. Locate one of the screens mentioned in Communication Basics that is marked with an * (asterisk) and click the email selection. If sending from the Communication module using New Email to Multiple Members, you will need to select the desired recipients first. 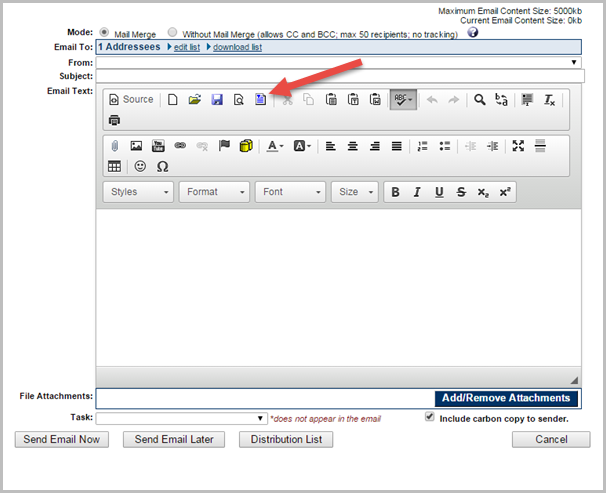 Create the email using features and selections from your own email program and send the email. 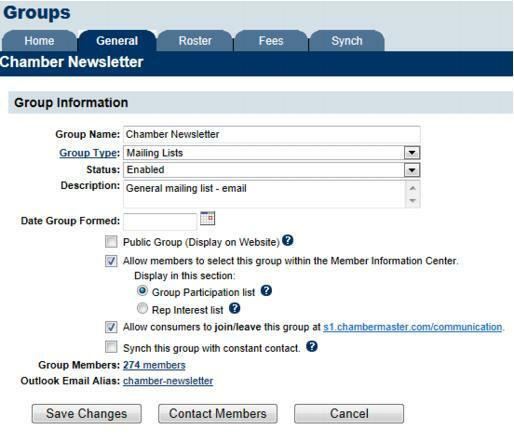 ChamberMaster will automatically record the email on the Communication tab of the member’s record. Emails sent in this manner will be sent to the -selected recipients as BCC recipients. You may add your own personal CCs or BCCs as desired. This email will be recorded on the members’ communication history. Initial replies from the recipients will also be recorded as long as nothing is changed in the email header such as the Send to:, Subject line etc. Consider the record of the reply as a bonus and not something that can be relied on. Due to email size limitations imposed by many ISPs in battling spam, the email editor displays an email content size indicator that updates as you type. It also displays the maximum email size left available. Since email addresses also use some available byte size, ChamberMaster determines this maximum remaining email size after addressees have been selected. The recommended method of sending documents to your members is by linking to them within the body of the email rather than by appending them to your email message. ChamberMaster provides unlimited storage space for any documents which you would like to upload and link to in your email messages. See Adding an Attachment. 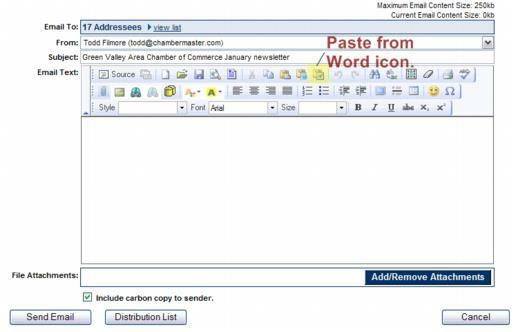 Note that ChamberMaster limits both the individual attachment size and the total communication size for email messages sent via the communication module. The total communication size is calculated as: number of recipients x (message size + attachment size) = total communication size. Select desired recipients. NOTE: Addresses selected under the Add Members heading will use the contact information found on the General tab of the member’s record. Addressees selected under the Add Representatives heading will use the contact information found on the Reps tab of the selected individual rep. Invalid email addresses have been quarantined. This provides you with a notification that invalide emails address were found in your database. You can click on the View Quarantined Emails link to view a list of the invalid email addresses. Contact has no email address - if this notification is displayed, you may click on <<edit address>> in the Email Recipients list to add the email address OR click the remove link to remove the recipient from the list. Email occurs multiple times - if this notification is displayed, you can click the remove link to remove the duplicates from the email recipients list. Click Send Email Now or Send Email Later (Available only for those with ChamberMaster Plus). If applicable, select Email with ChamberMaster. If sending from the Communication module using New Email to Multiple Members or Form Letters, you will need to select the desired recipients first. Create the email and click Send Email Later. Select the desired date and time for the email to be sent. ChamberMaster will send the email at the scheduled time and record it on the Communication tab of the member’s record. 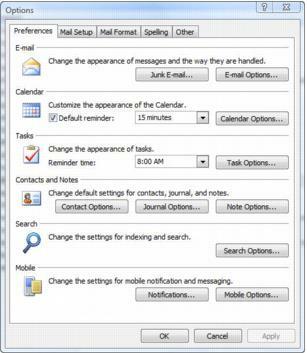 To view the scheduled email to edit or delete, click Communication in the left hand menu, and click Manage Scheduled Email Messages. Click Communication in the left hand menu. Click Manage Scheduled Email Messages. Click Edit to edit the content or change the delivery time. Click Delete to remove the email from the delivery schedule. You may view emails that have been scheduled to ensure that they actually were scheduled. If you’d like to reschedule the email, you may do that here as well. Click the Past Scheduled Emails tab. A single communication piece may be sent out to members by their preference of delivery: mail, fax, or email. When using the Preferred communication type Communication -> Form Letters the appropriate output will be developed for each recipient based on the member’s database fields. If addressees are selected as individual reps (by choosing the selections in the Add Representatives section) the preference as specified on their Reps tab in the Contact Preference field will be used. If addressees are selected as member companies (by choosing the selections in the Add Members section) the preference will be determined automatically according to the information specified on their General tab. If an email address exists, this will be the automatic first preference. If no email address exists, a complete mailing address would qualify as the next preference. Fax would be the last automatic preference. See FAQ How is the Contact Preference Used on the Reps tab? Select desired recipients. NOTE: Addresses selected under the Add Members heading will use the contact information found on the General tab of the member’s record. *Addressees selected under the Add Representatives heading will use the contact information found on the Reps tab of the selected individual rep. If applicable, click remove next to those identified under Preferred Communication Type as having no contact info, duplicate, or invalid info. Click Continue and compose the content of the letter. Step 1 - Create Mailings - this allows you to create print letters. Click Print Letters, choose your Print Options selections and click Continue to print your letters. Close the letter-printing windows and return to the letter composition window. (Optional) Click Print Labels and complete the Mailing Label Options selections and click Continue. Close the label-printing windows and return to the letter composition window. Step 2 - Faxes - this allows you to fax the letter to those whose preference is to receive communications via fax. NOTE: Fax communication is not faxed directly from within ChamberMaster. Instead, ChamberMaster produces the output that may either be printed and inserted into your own fax machine or downloaded and saved to a file that may be imported into popular fax software programs like WinFax Pro. ChamberMaster also supports a number of Internet Fax services. Contact support@growthzone.com to see if your provider is supported. Make any modifications to the fax output. Click Print Fax Content. Read more information on fax output options. 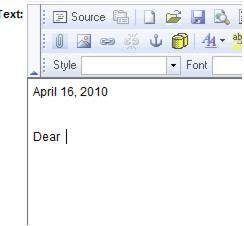 Close the print fax content windows and return to the letter composition window. Step 3 - Emails - this allows you to email the letter to those whose preference is to receive communications via email. Make any modifications to the email output. Make sure to type a subject line. Add attachments and links as desired. Communication may be sent to selected reps based on custom criteria that you specify as you create a custom report. For instance, your custom criteria might display those in a certain zip code area, or those that employ over 100 full-time employees. After displaying the results of your custom criteria selections, select Create a Group, type a Group Name, and select Submit. The next screen will give the option to Contact Members. See “Create a Group from Custom Criteria” in the Reports and Downloads section for complete instructions on specifying your custom criteria and creating the group. Select Mail Only in the Distribute By: section. If applicable, click remove if mail address(es) have been identified as having no contact information, duplicate addresses, or invalid addresses. Click Print Letters, complete the Print Options. Make sure to check the box to Save letter to communication log and type the desired communication log title. You may Print Preview to view the formatted output and remove unwanted headers and footers</span> if applicable. Complete the Mailing Label Options selections. Click Continue. Preview the labels on-screen is desired. Click Print. In the Print window that appears, ensure that Page Scaling is set to None. Single labels for a particular member are available in the Members module on the General tab, the Reps tab, and the Communication tab. Selections for printing mailing labels for multiple members are found in the Communication module (Form Letters) and the Reports module (Mailing Labels). The Reports module selection gives additional options specific to mailing labels that are not available when printing labels in the Communication module, such as a selection to download the labels and view a postal code summary. Click Mailing Labels in the Common Reports area. Add those that should have a label printed using one or more methods in the Settings area. See Figure 1-12. 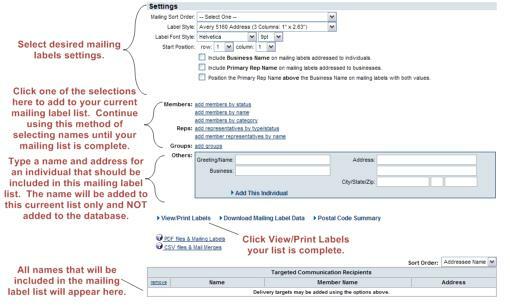 Select other desired mailing label settings. The selected labels will display. Insert the labels into your printer and click Print from the File menu or other desired method within your browser window. In the Print window that appears, ensure that Page Scaling is set to None. For specific selections based on your version of Adobe Reader, see “Proper settings for label output”. After selecting the desired local printer, click Print. Click Close to close the displayed labels. Click Form Letters in the Correspondence area. Select the desired addressees from the selections in the designated blue area. See Figure 1-13 below. Select Mail Only in the Distribute By area. Select the desired mailing label options. In the Print window that appears, ensure that Page Scaling is set to None. For specific selections based on your version of Adobe Reader, see “Settings for label output”. Click Close on each window that displays the labels, mailing label options, and the member correspondence window. Labels printed through your software will first display on your screen in Adobe Reader, allowing you to preview the resulting labels before sending to the printer. However, one selection in the print dialog box must be changed from the default to allow proper control of label placement. This selection looks different based on the version of Adobe Reader that is installed on your own computer. Page Scaling should always be set to None or 100% or Actual (wording varies depending on Adobe version). When Page Scaling is set to anything other than None (or the above identified choices), your labels may print off the labels or “slide” down the page as they print. You may say the labels shift or have improper alignment. 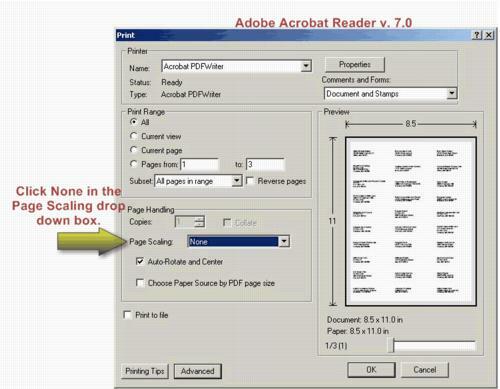 Tip: Sometimes your browser will open the PDF in a “mini reader” instead of using the Adobe program which doesn’t allow you to change these settings. You’ll need to disable these mini-readers in order to allow the software to control the label output properly. Watch a video to understand how this works. Firefox Users: Select Options from the Tools menu. Click Applications tab and search for Adobe and also for PDF. 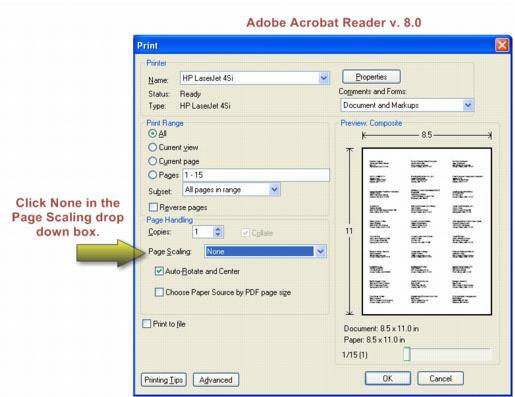 Change each selection to Use Adobe Reader. Internet Explorer Users: Select Manage Add-ons from the Settings menu. With Toolbars and Extensions selected change the Show drop-down to All-Add-ons. Then set the Adobe PDF Reader to Disabled. Your Adobe Reader version will determine what this setting will look like. If applicable, click remove next to those identified under Fax Only as having no contact info, duplicate fax #, or invalid fax #. Click Print Fax Content and/or Download Fax List. Read more information on fax output options. This requires a separate subscription with one of many well-known internet fax service. See “Internet Fax Service” in the “Administrator Tasks” section of online help for more information. Preferred Communication Type may be selected instead to select to send faxes only to those that have Fax selected as their preference. Select Append your file to the email directly. Click Browse… to locate the desired fax attachment file. Click Send Faxes via . . . Some email fax services may accept the cover page or the main content of the fax in the editor area instead of attaching the content and cover page as an attachment. Check with your email fax service or contact ChamberMaster for more information. The editor comes integrated with a spell checking solution that provides spell checking while you type. Words not recognized will be underlined in red. Right click on the word to be presented with suggestions, an option to Ignore, or add the word to your dictionary. Email Disclaimers appear at the bottom of certain emails generated by our software. Open the Email Server Settings area. Public Email Disclaimer: appear on emails that are generated by visitors that access your public website and click links that send emails to you or your members. For instance the “Request Info” link found on the members’ public information page. There are three options available for adding attachment to emails. Upload your attachment file to the ChamberMaster server and include a link to that file in your email: This is best practice. Increasingly when users send email attachments, ISP spam filters are identifying these innocent but potentially large attachments as spam. Consequently these emails and attachments never make it to their intended recipient. 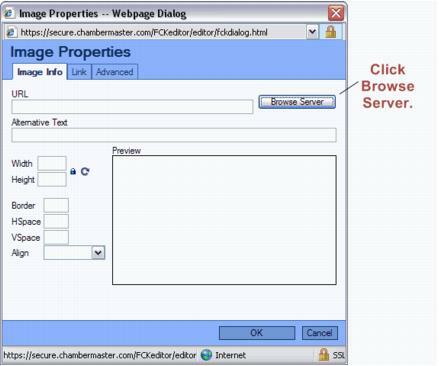 With ChamberMaster/MemberZone, you have the ability to upload your attachment to the server. Once the file has been uploaded to the ChamberMaster server and selected, a link is generated and automatically placed inside your email allowing the recipient to click to receive their attachment. Include a link within the email to a file hosted on your chamber website: This option allows the sender to create a hyperlink to documents or URLs located on other servers. A custom email link may also be generated using this selection. This selection is the same as the Insert/Edit Link icon available in the rich text editor, on the editor tool bar. Append your file to the email directly. The is the traditional way of sending attachments. This selection will send the document with the email, and is not recommended. Explained below are the steps for option 1, which is the recommended selection to reduce problems when sending through your ISP. On the desired email, click the Add/Remove Attachment button. On the Add Email Attachments screen, Upload your attachment file to the ChamberMaster server and include a link to that file in your email. is enabled by default. Click Continue. The Add an attachment dialog box will display. Enter the Text for Attachment Link:. This will be the text that appears in your email. Click the Browse button. Documents previously uploaded to the server will be displayed. Click the desired file and click Select. Click the Choose File button, to browse to the desired file on your local system. Browse to the file, select your file and click Open. Then click the Upload button. Once uploaded, click the file and click Select. The URL of the document will be populated in the Attachment File URL: text box. Your link text will now be populated in your email. 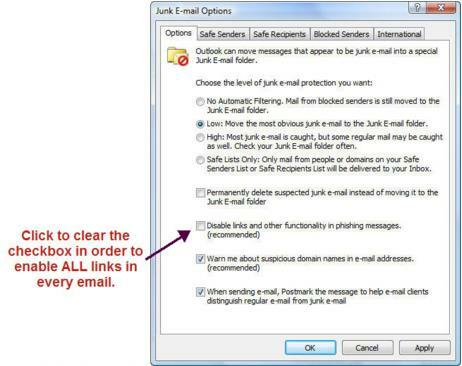 When receiving an email that contains embedded hyperlinks (links), the recipient may have trouble accessing the links due to settings prohibiting these links within their own email program. Many email programs disable access to these links by default in an attempt to alleviate phishing threats from un-trusted sources. To successfully open an embedded email link, the recipient may need to turn on the access to email links, either temporarily for a single email or globally for all emails. 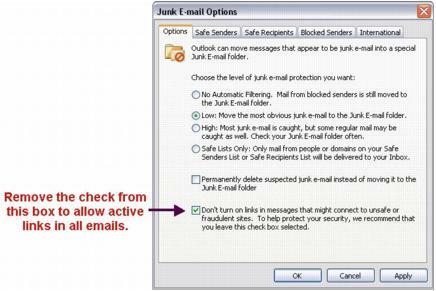 The instructions below are when using Microsoft Outlook 2003 or 2007 but other email programs may contain similar selections. Contact your email software provider for specifics related to your particular email program. After clicking the disabled link in the email, click Click here to turn on links in the Information bar above. See Figure 2 below. Click Turn on Links (not recommended). Click the link within the email again. Beware: Turning on all email links provides easier access to potentially harmful situations when the sender of an email wishes to direct you to a fraudulent site. Before opening the email that has the links, click Options from the Tools menu. Click Junk Mail on the Preferences tab. On the Options tab, click to clear the check box Don’t turn on links in messages . . .
Open the desired email and try clicking the links again. After clicking the disabled link in the email, click This might be a phishing message . . . (not recommend) in the Information bar above. See Figure 7 below. Click Enable Links and other functionality (not recommended). 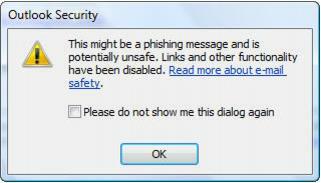 On the Options tab, click to clear the check box Disable links and other functionality in phishing message. Adding graphics to your correspondence is a simple process that requires initially uploading the graphic to the secure ChamberMaster server. Once uploaded by a chamber staff member, it is available to all chamber staff for inclusion within correspondence. Most graphic file types may be uploaded including .jpg, .bmp, .gif, .png and .wmf. The editor can be accessed from multiple places within ChamberMaster. For one example, click New Email to Multiple Members in the Communication module. 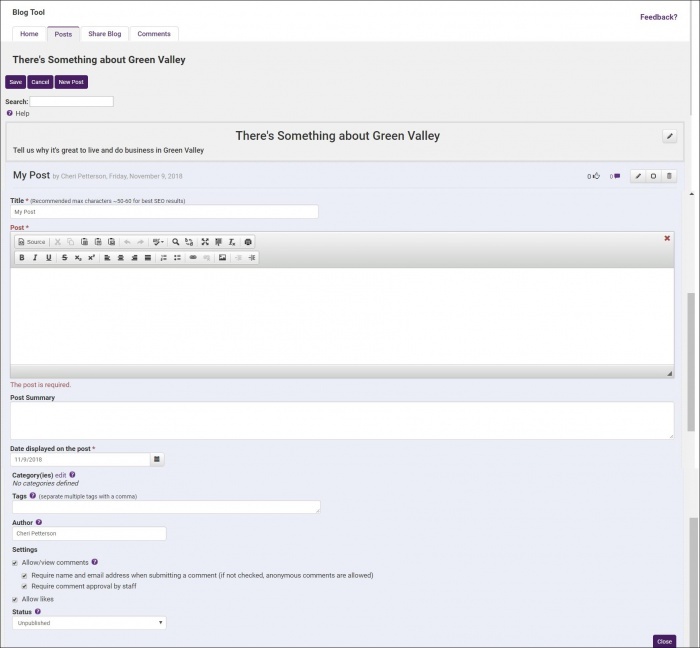 After selecting the desired recipients, the correspondence editor will display. Graphics may also be included in your signature block. Perform the same steps shown here but save it within your signature block. When your cursor is positioned where the graphic is desired within the editor, click Insert/Edit Image . Browse to the desired file and click it to select. See Figure 4-2 below. Or you may upload a new file to the ChamberMaster server by clicking Browse, browsing to the desired file, click to select, click Open, and then click Upload. Then you may click the desired filename to select it. If you choose to upload a new file to the secure ChamberMaster server, this file is also available to all chamber staff for inclusion in their documents. Make any desired changes on the Image Properties screen and then click Continue. See Figure 4-3. Locate the graphic that you desire to edit on the editor screen. Make desired changes. See Figure 4-3 in the previous section “Inserting a Graphic within Communication”. Click Allow access if necessary. 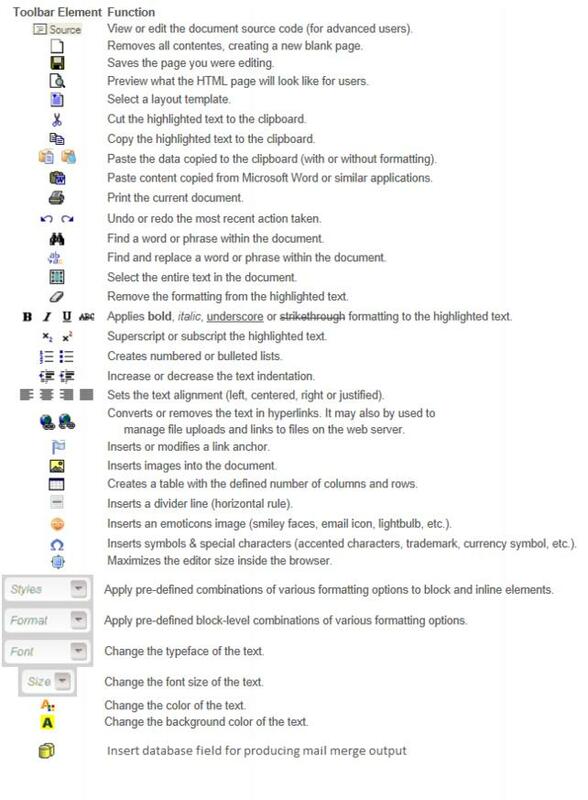 Within the editor, click Insert/Edit Image . Click the X at the end of the desired graphic to be removed from the ChamberMaster server. See Figure 4-5. Communication history can be viewed for a single member or viewed for the entire membership at once. See more on how to create the entries in the history. Select desired filters and click Refresh Listing. “Display bulk mail correspondence…”: When selected the history will include emails that were sent to multiple individuals at one time. This would include even those that had been sent to only 2 or more individuals. Task Categories: Tasks are created by you; create your own Task Categories to assist in organizing your communication. Communication may be sorted and filtered by Task Categories. A staff person with Admin permissions can create these under Setup->Correspondence Categories. Find the communication history using one of the ways listed above. Hover over the Subject title of the entry that you wish to view. The contents of the entry will display immediately in a pop-over window. Click the title of the desired item in the Subject column. When viewing the communication history, click Reports and select Print Summary Report or click Print Detailed Report. Follow the on-screen steps to print the output. When viewing the communication history, filter the history as desired. Click Reports and select Download Detail Report. See more on how to create the entries in the history. Communication created may be saved for future use in one of two ways - - as a document or a template. Saving a document allows you to name and save the communication piece to be retrieved at a later time, modified, and saved again. Saving a template allows you to save the communication piece to be retrieved at a later time but will not allow any modifications to be made to the original, thus maintaining the integrity of that communication piece. The table below lists the pre-defined email templates available to you. Announcement: Introducing Member Information Center Send if you are introducing the MIC to all of your members – or even just new members. Automatic Monthly Payment Invitation Send if using Integrated Payment Processing, and you wish to inform your members that they can sign up to have recurring fees automatically charge to a credit card or bank account. Automatic Payment Confirmation Send this email to your reps to confirm that you have set them up on automated recurring billing. Create Log-in Account Invitation Send this email to invite reps to create their log-in accounts. Can be used after analyzing which reps have not yet created accounts. Encourage Advertising of Events Send this email if you want to encourage your members to add their events to your calendar. NOTE: Events may be added by those members who have rights to do so, and you may or may not require approval. Encourage Deal Posting Send this email if you want to encourage your member to post hot deals. NOTE: Deals may only be posted by those members who have rights to do so, and you may or may not require approval. Encourage Job Postings Send this email if you want to encourage your members to post job postings via the MIC. Note: Job Posting may be posted only by those members who have rights to do so, and you may or may not require approval. Encourage Posting of Deals, Jobs, News, Events Send this email if you want to encourage your members to post deals, job postings, news & events via the MIC. This email template can be useful for new members just learning of the capabilities of the MIC. Encourage Submitting News Release Send this email if you want to encourage your members to post News Releases in the MIC. Note: Job Posting may be posted only by those members who have rights to do so, and you may or may not require approval. Remind how to Login to the Member Information Center Send this email to members if they have forgotten how to login to the MIC. Useful if you have identified members who are not logging in. 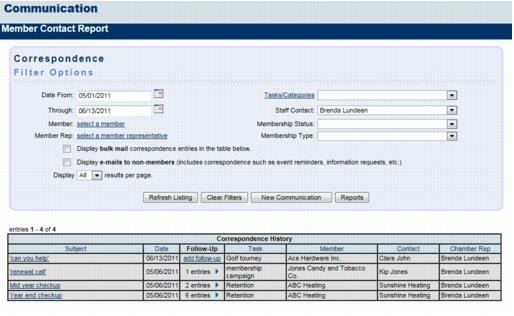 Update Your Member Listing This email template reminds the member to login into the MIC to review and update their information. The template includes the information that you currently have in the database for them to review. Open the editor and create the desired communication piece. Complete the Save Name and Description fields in the Save window ensuring that Save the text as a new document is selected. See Figure 5-1 below. Open the existing document and make desired changes. Click the Update an existing document radio button. 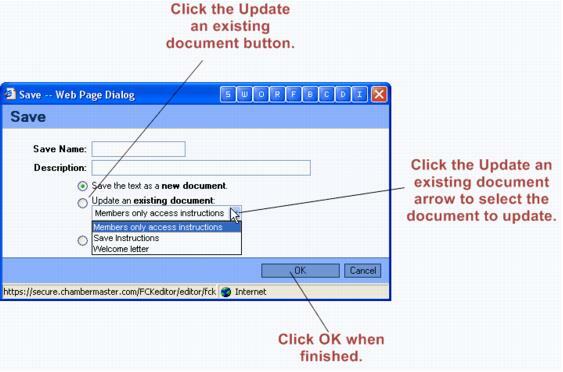 Click the Update an existing document arrow to select the desired document to update. Open the email editor and create the desired communication piece or open an existing document and make any desired changes. Complete the Save Name and Description fields in the Save dialog box. Click the Save the text as a new template radio button. A number of predefined templates are provided that may be selected and brought onto your own list of templates. You may use these templates “as is” or choose to modify and then re-save with your own name. Click here to view available email templates. 1. In the email edit screen, click the Choose a Template button. 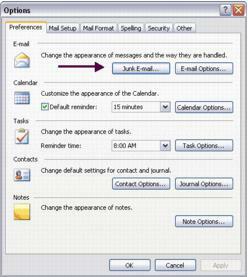 Figure: The email edit screen and Choose a Template button. 3. 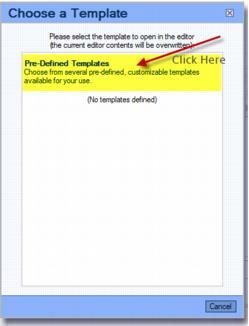 Click the template title to select the desired predefined template. 4. Click OK to select another template right now or click Cancel to return to your own list of templates. 5. Once on your list of templates, click to select the desired template. 6. 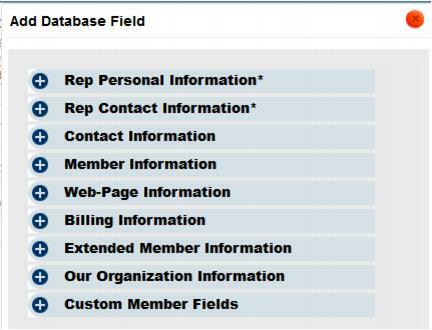 All fields with [ ] will auto-fill with the data from the member’s record or from your association contact information where appropriate. Similar to performing a Mail Merge in Microsoft Word, ChamberMaster / GrowthZone maintains the ability to insert a database field within the context of your communication piece, creating personalized, unique communication output. When you desire to insert a database field, click the Add Database Field icon. ( ). Click the plus sign ( ) to expand the desired section and display available database field selections. As you continue and actually generate the communication output, the field name will be replaced with the appropriate matching data for that member. Proceed with standard steps to complete this communication. All fields displayed in brackets will be filled with data from the member’s record. Your members will want to login to the Member Information Center in order to view and update their membership information and member webpage, view and add Hot Deals, view and submit events, and view and add job postings. Instead of sending their login name and password to them, you can generate an email and include a link so the member can automatically retrieve their login information. A number of pre-defined templates are provided that are ready to send out and already include links to your login page and a link where they can retrieve login information. See “Using Pre-Defined Templates”. Feel free to use any of these or use the steps below to create communication of your own. If you still wish to send out the login and password to your members, follow the next steps to create and print individual letters to each of your members that include login information. Sending passwords via mail may be more secure for sending passwords since most email is unencrypted. If you desire to send the login information via email, follow the same general steps below except you will select New Email to Multiple Members for Step #2. When creating reports and correspondence in ChamberMaster, the preview window is displayed in a browser window (i.e. Internet Explorer). Internet Explorer has a default header and footer that are wonderful when printing pages from the web, but when printing out your formal ChamberMaster reports or letters it is not usually desirable. The codes with the & (ampersand symbol) represent certain elements within the Internet Explorer header and footer. Use these to customize your own header or footer! Saving your signature block as a template may save time when creating correspondence. Design your signature block with any included text and graphics. You may also include items that would belong in the header such as your logo. Save it as a template. 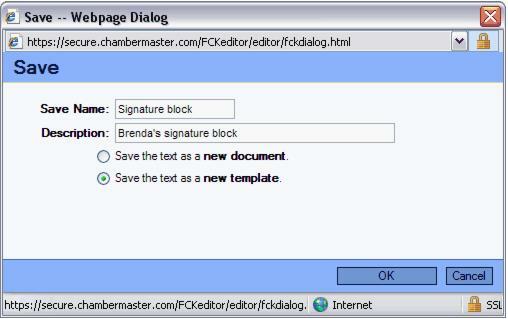 When ready to create your correspondence, first retrieve the signature block using the Choose a Template selection. Then type your correspondence above your signature block. When the editor displays, create the desired signature block. Hint: You might want to start the signature block with two blank lines before your actual signature lines. Complete the Save Name/Description fields in the Save window. Click the Save the text as a new template. radio button. 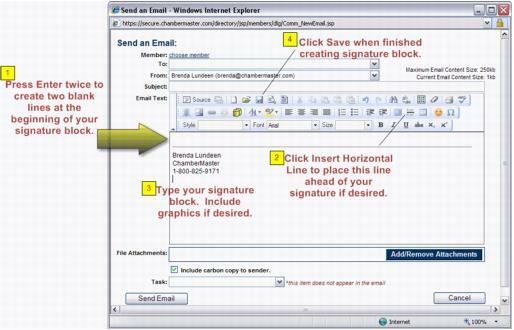 After creating the signature block, it may be used at any time when sending emails or letters. 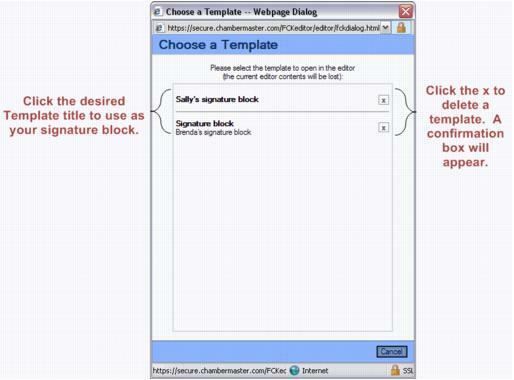 See “Using a Signature Block”. Open the editor by selecting one of the many ways to send an email or create letters in the software. Click the template title to select the desired signature template. Your signature block will appear. Type the desired communication. Your signature block will “move” down the page as you type the communication. 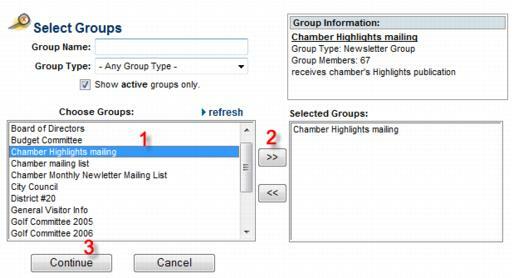 Sending communication via email and letters may be simplified by creating self-defined groups in the ChamberMaster Groups module. For instance, if you frequently send emails to your Budget Committee . . instead of selecting the 12 members of that committee each time you send an email, you first create a group in the Groups module called the Budget Committee. Add each of the 12 members to that group. Then when you go to send the email, you simply select the Budget committee as the recipient of the email with one simple click. If you send a monthly newsletter, the Groups module is where you will create and maintain this mailing list group. This group may then be selected at the appropriate time throughout ChamberMaster when you desire to send them email or print mailing labels and letters for them. Complete the Create a New Group fields for this new group. Click the General tab. Make sure the settings are correct. When selected, this roster list will be shown as a group/interest that may be searched by members in the Member Information Center. When selected, members will have opportunity to join/leave this group/interest on their own in the Member Information Center. The selection of Group Participant list or Rep Interest list determines where the selection will take place – under Groups or under Interests. Interests. When selected, this group will display on your website in the Groups public module available at http://yoursubdomain.yourdomain.com/groups. When selected, this group will appear on your public website at the suggested URL where the public may add themselves to the group. Often used for consumers to subscribe to (join) your mailing lists. Click one or more of the Add Group Members selections to add members to your group. Continue adding representatives to your group using the Add Group Members selections until your group is complete. Examples of the various ways to add group members follows. Community Member Reps are those individuals specified on the Reps tab in the Members module for the record titled [Community Member]. These individuals are not associated with a particular company/member but may still be selected as group members. When selecting to add reps by member, all reps from that selected member will be added to the roster list. Then, if desired, you may remove all Inactive reps by clicking Remove Inactive Reps at the bottom of the roster. All inactive reps from all members would be removed from the group at that time. 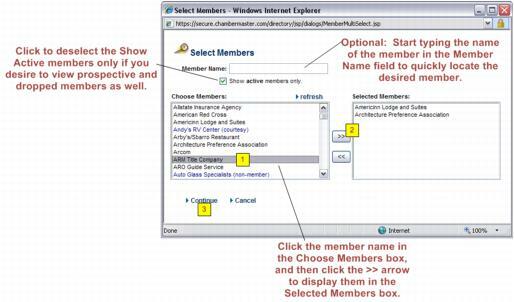 More than one member may be selected by pressing Ctrl-click on each desired member. Then click the >> arrow. In this example, the Automotive Parts & Service category has only one active member but also one member that may be courtesy, prospective, non-member or dropped. With settings currently displayed, only the one member’s reps will be added to the group. Only one category may be selected at a time. Only one group may be selected at a time. Use this selection to create a new group based on membership from a previous group or to merge reps from another group into this new group. No reps are removed from the source groups – just copied. 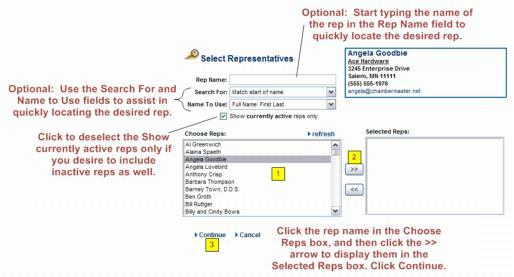 More than one rep may be selected by pressing Ctrl-click on each desired rep. Then click the >> arrow. Contact information (i.e. email addresses, phone numbers, addresses etc.) are updated automatically when changes are made in the Members module. Group membership must be maintained through manual selection or removal of names. Adding new member names to the groups could be done at any time, however, two detailed concepts are provided below that may assist in providing a consistent procedure at your chamber. The two examples are adding new members to the mailing list either periodically or immediately. Removing representatives from mailing lists or groups may be done at any time manually or may be completed during the process of changing a member status to Dropped/Inactive. Group membership must be maintained through manual selection or removal of names. To keep your initial mailing list up-to-date, you might consider adding new members to the appropriate mailing lists immediately after creating the new member record. Following is one example of how this might happen. 1. Immediately after a new member has been added to the ChamberMaster database and with the new member record selected in the Members module, click the Reps tab. 2. Ensure that all desired reps for this new member have been added. If not, add reps at this time by clicking Add a New Rep.
3. Click the name of one of the reps in the List of Representatives area. 4. Scroll to the Group Participation area at the bottom of the screen and click Join a Group. 5. Click the desired group to join. 6. Click the double right arrow to move the desired group to the Selected Groups list box. 8. If this representative should belong to more groups, complete steps 4-7 again until they belong to all desired groups. 9. If other representatives should belong to groups as well, perform steps 3-7 above and select the next desired representative. Representatives are removed from groups manually or during the process of changing a member status to Dropped/Inactive. Click Groups in the left-hand navigation bar. Click the Group Name of the mailing list to be modified. Click to select the check box at the end of the row of the desired rep to be removed. Finding a rep may be done multiple ways. If the business name is known, sort the roster by Business Name as shown in Figure 9-25. If the individual rep name is known, sort the roster by Rep Last Name or use the magnifying glass to search for rep by last name which displays when displaying a limited number of records on the page. The selection to change a member status is found on the General tab of the member’s record in the Members module. Select Dropped/Inactive when clicking the Membership Status arrow in the Additional Information area. 1. When changing the status of a member to Dropped/Inactive, the Member Drop Options screen will appear. In addition to the member status, each rep has a status of either Active or Inactive which is displayed for each rep on the Reps tab. 2.Complete the Member Drop Options screen as desired. Note the Representatives area selections as detailed on Figure 9-23 below. Active status is appropriate for representatives of members that are currently active. Inactive status is appropriate for a rep who is no longer acting as a representative for the member. The rep’s information and history will be retained but there is a separate distinction given to them in reports and lists. Deleting a rep should be limited to a rep that was created by mistake. History and all reference to this rep would be removed. Disabled reps within a group are not visible in the group list on a regular basis and will not be included when selecting to contact these group members. Disabling a rep also preserves the history of their participation in this group. Deleting a rep from a group, removes all record of their participation in the group. Note: Representatives that have a status of inactive will NOT automatically be returned to active status if a member is reinstated. Individual reps must be returned to active status on the Reps tab. 3. Click Save & Exit. At times it may be necessary to disable a rep within a group. These members are not visible on a regular basis and will not be included if you select to contact these group members. View them at anytime by clicking Show Disabled group members. The history of their participation in this group may be preserved this way. Click to select the member or members that should be disabled. Note: You can also view their group participation on the Reps tab of the member record. Make changes to the reps status from the Reps tab by clicking the Group name. Note: Both active and inactive reps may be set as disabled. Inactive reps, that are not disabled, are still included in emails sent to the group. Members may choose to join or remove themselves from groups that have been designated by Chamber staff. When a member logs into the Member Information Center, they are able to select the desired groups. Select the title of the desired Group. 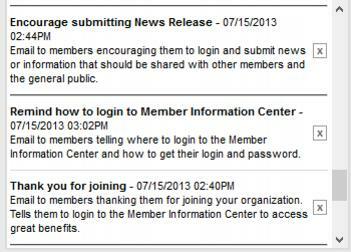 Member accesses [] and logs in to the Member Information Center. Click Employees/Reps in the Member Info section of the left-hand menu. Click to select the checkbox in front of the desire group to join (or click to deselect the desired group to leave). Allows the public (consumers, non-members) and members to easily sign up for groups. It’s a public module, like the business directory, event calendar, etc. Many tasks in ChamberMaster are made simple when groups are defined. For instance, communication may easily be targeted to a pre-defined group and the database may be queried for a particular group. The suggestions below may trigger some of your own ideas on how to create and use groups. Remember, these are simply some ideas - - use your own creativity in naming and organizing potential groups. Due to increased vigilance from outside organizations that rank email sender reputation, having a clean email address list is very important to ensure all of our customers can continue to communicate reliably to their members. To assist you in this task, a new process will be enabled in the upcoming months that will scan your email addresses for invalid status. The following types of addresses would be considered invalid: Addresses where the syntax is incorrect (e.g. multiple @ symbols, extra space, etc. ), the domain of the email address doesn't exist, the address of the recipient no longer exists on the receiving server, and when the MX record of the domain itself doesn't exist. These are all cases where the email would never make it through to anyone. GrowthZone has implemented processes to identify and quarantine emails that have been identified as invalid in your database, while keeping you in full control of your addresses. An Email warning of upcoming quarantine will be sent 30 days prior to quarantine to notify you that email(s) are to be quarantined. This email is sent to those staff members who have subscribed to the Invalid Email Address Notifications notification (See Staff Email Notifications for information on subscribing to the notification). Sample Email. Change Address – this option will allow you to update the email address, and it will then be run through the nightly scan. If the email address is verified, it will be returned to normal status. Mark As Good – this option allows you to mark an email as good and return to normal status in the database. It will be rechecked in 90 days. NOTE: A new item has been added to the Task List, that will allow you to link to quarantined emails and perform the actions described above. A reminder email warning will be sent five days prior to the final quarantine of emails. Sample Email. One final email will be sent, on the day of the quarantine, indicating the emails have been quarantined. But, note, that staff may recheck, change or mark as good at any time, even if quarantined. NOTE: You can check on the invalid list at any time by clicking Invalid Emails in the Task List. The Quarantined Invalid Email Address report provides a list of all emails that have been marked as invalid, and removed from your database. Due to increased vigilance from outside organizations that rank email sender reputation, having a clean email address list is very important to ensure all of our customers can continue to communicate reliably to their members. The following types of addresses would be considered invalid: Addresses where the syntax is incorrect (e.g. multiple @ symbols, extra space, etc. ), the domain of the email address doesn't exist, the address of the recipient no longer exists on the receiving server, and when the MX record of the domain itself doesn't exist. These are all cases where the email would never make it through to anyone. The report consists of two sections: Emails Quarantined and Will Be Quarantined. The report includes the email address, name of member or rep, the member/rep ID, location in the database the address has been removed from (clicking the location will take you to the page in the database where the email was used), reason why the address was removed, date of removal. NOTE: When an email is removed, an automated email will be sent to all staff that are signed up to receive email notification. All staff will be set to have this notification enabled by default. A sample email is shown below..
On the Quarantined Invalid Email Report click the Re-check link next to the email address you would like to check. The results of the re-check will be displayed, as shown below. If the address is found to be valid, will be removed from the Quarantine list. If the address is found to be invalid, it will remain on the quarantine list. After running Re-Check, if you've personally verified this address is good even though the verification system indicates it is not, we've given you an option to mark it as good and remove it from the Quarantine list. Please do not abuse this option; we want to protect your email sender reputation. On the Quarantined Invalid Email Report click the MarkAsGood link next to the email address you would like to mark as good. Review the warning information on the Mark as Good dialog box. If you wish to proceed, click the Mark as Good button. Using the Quarantined Invalid Email report, you can correct an invalid email address. The correction will be updated throughout their record; the current address will then be removed from the Quarantine list. On the Quarantined Invalid Email Report click the Change link next to the email address you would like to change. Enter the new email address in the Please replace email address... text-box. Store your documents in the Cloud Drive, a selection in the left-hand menu of your software, to access them anytime from any computer that has a connection to the internet and access to the database. 10 GB of storage space is available to you. Upload files to My Documents for your personal use or into Shared Documents to make them available for your entire staff. Locate these two tabs by clicking Cloud Drive in the left-hand menu or by selecting the desired folder from the Common Tasks tab in the Dashboard module. Click Cloud Drive in the left-hand menu. (Optional) Click New folder to create a folder to organize your files or double-click on the desired folder. 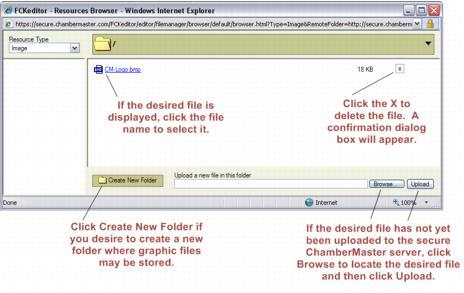 Locate the desired file to upload and click Open. The selected file will be uploaded into your document storage. Access this document anytime by clicking My Documents in the Cloud Drive or on the Common Tasks tab in the Dashboard. Note: only available for those with Plus edition or greater. Other staff members may now access this document by clicking Shared Documents in the Cloud Drive or on the Common Tasks tab in the Dashboard. Note: a new non-removable Members Only folder appears under the CloudDrive Shared folders area. This folder was placed there by our programmers in preparation for a future release that will provide a location for staff to place member-only files and folders. Placing files in this folder will not hurt but will not do anything for you or your members at this time. Stay tuned! 1. Click Cloud Drive in the left-hand menu. 3. (Optional) Click New folder to create a folder to organize your files or double-click on the desired folder. 5. Locate the desired file to upload and click Open. 7. The selected file will be uploaded into your document storage. 8. Other staff members may now access this document by clicking Shared Documents in the Cloud Drive or on the Common Tasks tab in the Dashboard. Any files uploaded to the Email Attachments area in the Cloud Drive will be available to be attached to an email when sending using the software’s editor. These files are also available as public links without being sent in an email when the link is made known to the end user. Note: The Cloud Drive tabs are only available for those with Plus edition or greater but the Email Attachments are accessible under Dashboard-Common Tasks. 2. Click the Email Attachments tab. 4. Locate the desired file to upload and click Open. 6. The selected file will be uploaded into your document storage for use as attachments to emails or as a public URL. 1. Access the email editor. 2. Click the paper clip icon . 3. Click Browse and find your uploaded file. 5. Click OK to embed your file as a link or copy the Attachment File URL and give that URL to users that need to access this file. Any files uploaded to the Email Images area in the Cloud Drive will be available to embed as an image in the body of an email when sending using the software’s editor. 2. Click the Email Images tab. 6. The selected file will be uploaded into your document storage for use as a graphic to embed in an email or other locations the editor is available. 5. Click OK to embed your image in the body of the email. "Why do some members say they don’t receive email messages that I send through ChamberMaster/GrowthZone?" "Why can some members receive messages from me when I send through Outlook but not when I send out of ChamberMaster/GrowthZone?" "What can I do to make sure my members get the email messages I am sending through ChamberMaster/GrowthZone?" When sending communication from ChamberMaster, you will find various ways to create the content of the communication – whether email or printed letter. 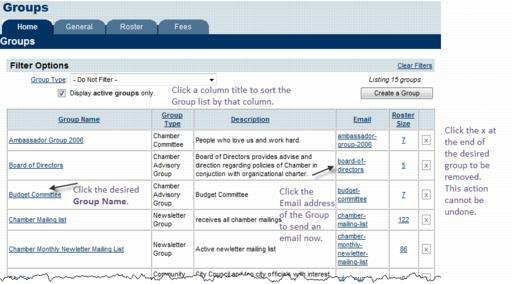 Spontaneous, individual and small group emails are often created “on-the-fly” by creating the message right at that moment in the ChamberMaster editor screen. Other communication may take more preparation or commonly be created with software other than ChamberMaster. Sometimes these pieces of communication have already been prepared in other software using a template or even created by an outside company and then provided to you by the publisher. Examples of this communication may include monthly newsletters, weekly information email blasts or other regular communication pieces. In many of these cases, the development of the communication piece may be done outside of the ChamberMaster editor screen and then copied into the editor or included as a link or graphic within the email. If you are comfortable with the HTML programming language, you may wish to create your own HTML code in the ChamberMaster editor. Copying and pasting HTML code is also an option. 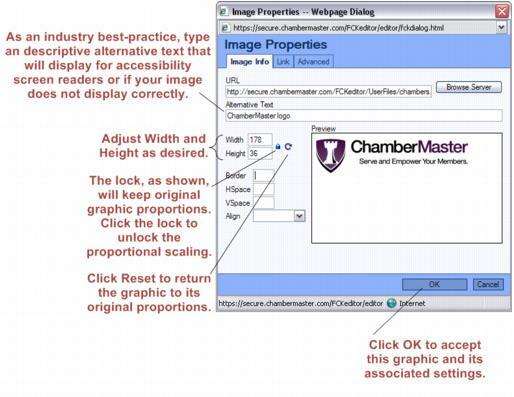 Click the Source icon in the ChamberMaster editor screen before pasting HTML code or to view and modify existing code. Common methods of inclusion will be shown below. Mix and match these methods as desired to accomplish regular communication to your members. Many chambers desire to send a regular email indicating the events for the week. Step-by-step instructions for generating this email are included for reference at the end of this document. Some chambers are interested in creating their own e-newsletter using templates that are professionally provided by our partner, Constant Contact. Find more information on this option by clicking Newsletters/Email Campaigns in the Reports module or by visiting http://www.constantcontact.com/. ChamberMaster provides an export or automatic synchronization to Constant Contact for your convenience. Access the editor and type your own communication using the features available within the ChamberMaster editor. 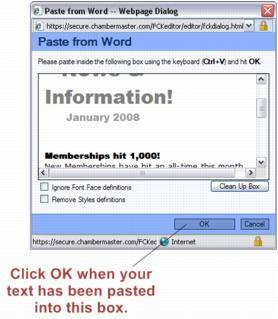 If your communication content is already created in Microsoft Word, you may be able to copy and paste the content directly into the ChamberMaster editor screen. Content that works well include character formatting styles of bold, underline, and font changes. Content that does not copy well include columns, graphics, and tables. Documents with these items should either be recreated directly in ChamberMaster by editing the HTML source code by clicking the Source icon or included as a link. (see “Insert link to PDF file”). Why do columns, graphics, and tables not copy well from Microsoft Word into ChamberMaster? Most internet based applications such as ChamberMaster base their functions on a programming language called HTML. Transferring data directly from programs that are not programmed in HTML may not always be successful. If you know the HTML language, editing is allowed by clicking the Source icon in the ChamberMaster editor window. In Microsoft Word, open the desired content to be copied. In another window, open the ChamberMaster editor screen where you desire to copy the content. In the ChamberMaster window, click where you desire the content to appear. Click the Paste from Word icon ( ) in the menu bar. Copying and pasting HTML code is also an option. 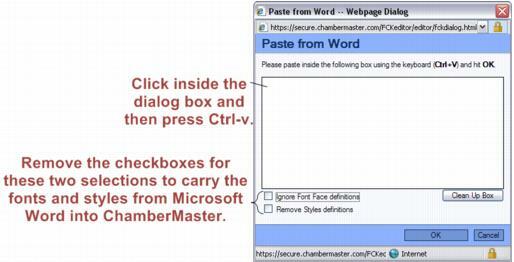 Click the Source icon in the ChamberMaster editor screen before pasting HTML code or to view and modify existing code. Since many users are familiar with pressing Ctrl-v to copy, you may still access the Paste from Word dialog box using this keystroke. However, you may be asked to allow access to the clipboard. Click Allow. Then you may be asked if you wish to clean it before pasting? 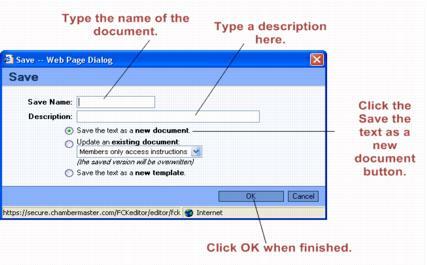 Click OK.
Then you will be brought to the Paste from Word dialog box and may continue with the steps starting with #6. Click inside the Paste from Word dialog box. Press Ctrl-v to paste your text. Clear the checkboxes from Ignore Font Face definitions and Remove Style definitions in order to carry the fonts and styles from Microsoft Word into ChamberMaster. Your formatted text will appear in the editor window. Complete the email as desired. Insert link to PDF file (or other file type) Many pieces of communication are already prepared in other software using a template or even created by an outside company and then provided to you by the publisher. Examples of this communication may include monthly newsletters, weekly information email blasts or other regular communication pieces. In many cases, a PDF version of the output may be provided to you by the third party or may be easily created by you. This type of file may be included as a link within your email and opened by the recipient retaining all formatting features. In fact, the PDF version may provide advantages over an embedded version (i.e. the copy and paste method) that may be appealing. Links may be included to access a Microsoft Word document, Excel spreadsheet, or any type of file that would traditionally be sent as an attachment. However, keep in mind that the recipient of the email must be able to open the file on their end. If they do not have the program themselves or have a different version of your software, they may not be able to view the file you have referenced within the communication. Sending a PDF version of the file eliminates that issue of compatibility. PDF (Portable Document Format) is a universal file format developed by Adobe® that preserves all the fonts, formatting, graphics, and color of any source document, regardless of the application and platform used to create it. You will find PDF a very common format which is widely used on the internet due to its platform independence. Some cited benefits of including a link to a PDF version are that 1) the email size is kept small since the PDF file is not calculated as part of the email total and 2) the recipient may save and print the PDF separately from the traditional email printout creating nicer looking output on the recipients end. 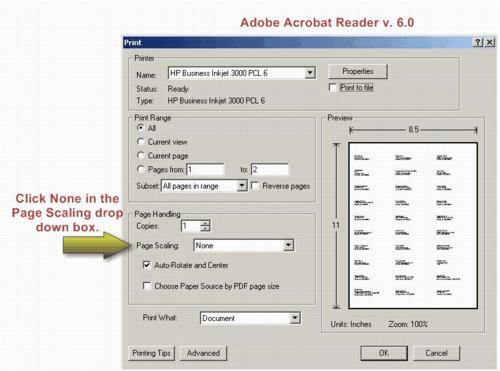 To view PDF files you need Adobe Acrobat Reader which is downloaded free from here and is commonly loaded on most computers that access the Internet. Many software programs, both for purchase and those at no charge, are available to create PDF versions from output of your most common applications. Newsletters or brochures created in Microsoft Word, Microsoft Publisher or other popular applications may all be saved in a PDF version using these PDF creation programs. 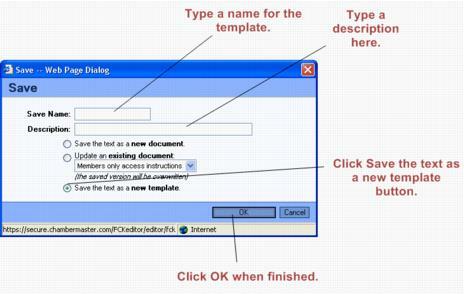 Once your output is in the PDF format or you have the desired attachment prepared, follow the steps below to include the document as a link within your email. 1. Open the ChamberMaster editor and begin to create the desired communication piece. 2. Click where you desire to insert the link to your document. 4. 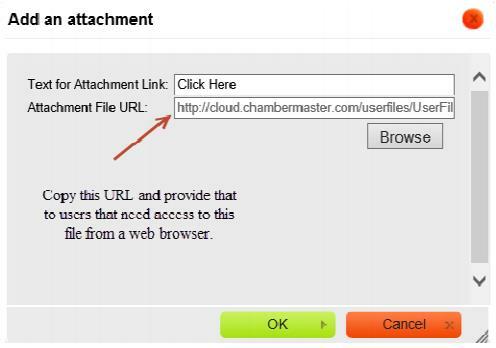 Click Upload your attachment file to the ChamberMaster server and include a link to that file in your email. See Figure 12-8 below. 6. Type the desired text in the Text for Attachment Link field. Then click Browse Server. See Figure 12-9 below. 7. Browse to the desired file and click it to select. See Figure 12-10 below. Or you may upload a new file to the ChamberMaster server by clicking Browse, browsing to the desired file, click to select, click Open, and then click Upload. Then you may click the desired file to select it. 8. Click OK. See Figure 12-11 below. 9. The link will automatically be inserted in your document. Save Microsoft Publisher files as a graphic file and insert into editor If you’d like to display the content of a Microsoft Publisher file in the body of your email instead of using a link to a copy of it, there is a way to do that might be helpful to know. 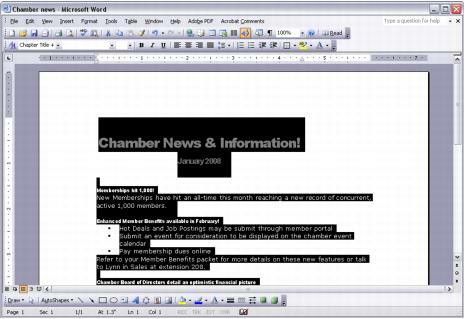 Being an HTML editor, ChamberMaster’s editor allows copy and paste of HTML content. Therefore it is possible to produce your communication piece in other programs, like Constant Contact, and simply copy and paste the final version into the ChamberMaster editor. Care should always be taken that the content is coming over properly but we have found it to be quite successful. Please send yourself a copy of the email first to verify that the content and appropriate links are maintained. Here is an example using Constant Contact. In Constant Contact, click Preview. When the preview window displays, highlight the final version that displays on the screen. Open a ChamberMaster editor screen with the desired recipients selected. The content will display in the ChamberMaster editor. Some content may not appear to be displaying properly while in the editor but will display correctly when received in the editor. Please send a sample copy to yourself to test it out first. No guarantees or support is available for this method from ChamberMaster but it has worked successfully for a number of chambers. The ChamberMaster/GrowthZone member management system allows you to connect to your Constant Contact account to automate updates to your Constant Contact lists based on updates made in the database. Once configured representatives that have been added to the database or specific groups will automatically be added to Constant Contact. Any reps that are disabled within in a group will be removed from their respective lists. Representatives may be synchronized to Constant Contact automatically or manually. Automatically sync all active reps for active and courtesy members. If this option is enabled, each time the nightly synchronization is run, Constant Contact will remove all the contacts in its All Active and Courtesy Representatives from ChamberMaster/MemberZone list, and recreate the list with the information received from ChamberMaster/MemberZone in the nightly sync. Automatically sync membership types daily. If this option is enabled, Constant Contact will delete all contacts in its membership type lists, and replace with contacts received from the ChamberMaster/MemberZone nightly sync. Automatically sync groups daily. If this option is selected, all groups will be synchronized nightly to Constant Contact. 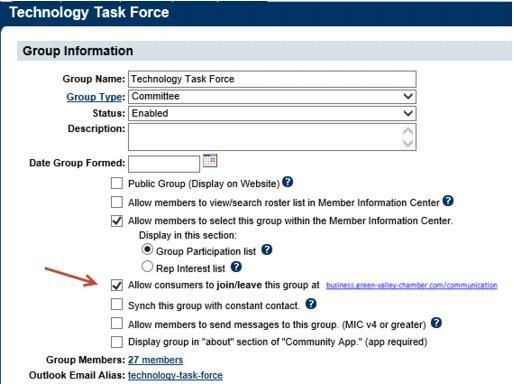 You may select specific groups to be synchronized via the Group > Sync tab. When synchronization occurs, Constant Contact will (1) Remove any reps that have been disabled in the group, (2) Add any reps that have been added to the group as active group members. Groups are matched by group name. If the group does not exist in Constant Contact, it is automatically created. See Enable Constant Contact Synchronization for further instruction on configuring your nightly synchronization. Groups may be manually synchronized from the Synch tab, within the Groups module. When a group is manually synchronized, Constant Contact will remove all contacts in the list, and replace with the reps received from the ChamberMaster/MemberZone manual sync. Groups are matched up by name between Constant Contact & ChamberMaster. If the group doesn’t exist in Constant Contact, it is automatically created. When Groups are synchronized to Constant Contact nightly, reps that have been deleted from the group will NOT be removed from the list in Constant Contact. Best Practice is to disable the rep from the group and not delete. If you do wish to delete the rep, disable the rep first, then after the next synchronization you may delete the rep.
Reps that have unsubscribed from your database mailing list will not be included in the synch to Constant Contact. Follow the prompts to authorize the database with your Constant Contact account. Once you have authorized connection between ChamberMaster/MemberZone & Constant Contact Authorization for this application to sync contact data to your Constant Contact account has been completed. will be displayed. Choose which items you would like to have automatically synchronize each night. See Nightly Synchronization for further information. If you do not wish to synchronize all groups, see Selecting Which Groups to Synchronize for more information. When Groups are synchronized to Constant Contact nightly, reps that have been deleted from the group will NOT be removed from the list in Constant Contact. Best Practice is to disable the rep from the group and not delete. Once the Constant Contact synchronization is setup you will be able to configure which groups are set to be synchronized each night. Automatically sync groups daily must be enabled in the General Options & Settings to initiate nightly synchronization. See Enable Constant Contact Synchronization for instructions. Select Groups in the left-hand navigation panel. A list of those groups for which you enabled synchronization will be displayed. For each group that you wish to synchronize, click the Synch Now button. NOTE: If you wish to synchronize groups that have not been configured for nightly synchronization, clear the Display groups set to synch only check-box. All groups will then be displayed. The synch process is now initiated. You can view the status of the synch on the Activity report in Constant Contact. NOTE: When a group is manually synchronized, Constant Contact will remove all contacts in the list, and replace with the reps received from the ChamberMaster/MemberZone manual sync. Groups are matched up by name between Constant Contact & ChamberMaster. If the group doesn’t exist in Constant Contact, it is automatically created. If automatic synchronization is not being used, or if manual exporting/updating is desired, use the steps here to export ChamberMaster/GrowthZone contacts so that they may be directly imported by Constant Contact. Click Newsletters/Email Campaigns in the Other Communication Tools section. There are multiple ways of using your database and Constant Contact to maintain and keep contact information current. Below is one method that may work for you. Evaluate your own needs and contact Constant Contact for details on using their software. Each time you are ready to perform a mailing, follow instructions above to export your entire set of contacts from ChamberMaster. 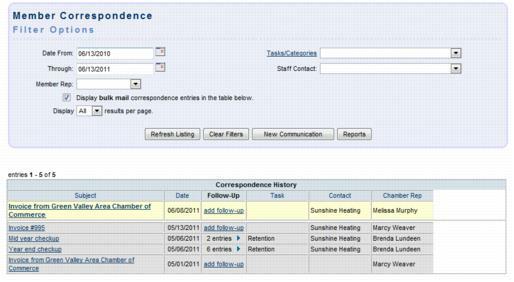 In Constant Contact remove all contacts from the current “ChamberMaster Contacts List”. Then import the new ChamberMaster export into this list. When sending the email, select both the “Standard Mailing List” and the “ChamberMaster Contacts List” as recipients of the email. Make sure to keep the email addresses for your contacts up-to-date in ChamberMaster which will follow-through into Constant Contact and end up in the “ChamberMaster Contacts List”. 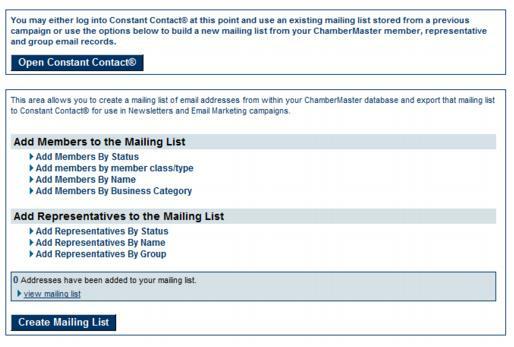 Updates to those contacts not in ChamberMaster may be done in Constant Contact on the “Standard Mailing List”. Clearing the “ChamberMaster Contacts List:” in Constant Contact each time will not eliminate the Opt Out list. Those that have opted out of your mailings (Do Not Mail) will be retained. Constant Contact keeps a list of these addresses internally. If a ChamberMaster contact manually tells you they would like to opt out of your mailings, you need to select the Do Not Mail selection in Constant Contact. Then when they are imported from ChamberMaster, Constant Contact will not allow the import since they are listed as Do Not Mail. If a ChamberMaster contact manually tells you they need their email address updated, you would need to change it in ChamberMaster so that it will be imported correctly next time. If a ChamberMaster contact manually tells you they need a new address added to the mailing list, either add their email address as a New Rep in ChamberMaster or add them as a contact in Constant Contact in the “Standard Mailing List”. The Constant Contact Email History and Bounce History may not be retained since the ChamberMaster Contacts List will be cleared each time. Constant Contact only keeps history for 90 days anyway. When importing the contacts from ChamberMaster, all of the Constant Contact fields are updated with the information from ChamberMaster. If custom fields or other contact information fields have manually been updated in Constant Contact, they would be overwritten by the information coming from ChamberMaster each time. If these additional fields are not being used by you in Constant Contact, then this will not affect you. What happens when I change a representatives email in ChamberMaster/GrowthZone? Once synchronization to MailChimp is setup, then each night an automatic sync from your database into your MailChimp account will take place which will copy contact information from your database into the designated MailChimp list. If you’ve done updates to your mailing list in the database and you’d like to sync during the day, there is a “Sync now” choice available to do at any time. MailChimp synchronization is available to those with Plus edition or greater. All active reps of active, courtesy or prospective members. Groups that have been marked to Sync under the groups module. The maximum number of groups per Group Type that may be synchronized is 60. Note: Groups synchronization will include inactive reps in the synch as long as they are marked as active within the group. Click Click to Enable MailChimp. Enter your MailChimp login and password. The message will say that you are connected. Click the drop-down arrow and select the list you already have in MailChimp where you would like the contact information to be imported. Click Sync Now to immediately copy your contacts to MailChimp. Tip: Note this sync will happen every night but you can manually sync any time you’d like. All the contact information will be updated in MailChimp. Note: The System Event Log will display the synchronization transactions. Errors typically indicate invalid email addresses. The consumer selecting the Contact these Businesses button within your directory. You can enable the Contact these Businesses button via the Directory Control Panel settings. See Modify the Directory Control Panel for details. The consumer submits a Request for Proposal. NOTE: The Pro edition of the software is required for Requests for Proposal. See Requests for Proposals for further details. Staff signed up for All Web Leads Pending Approval will receive and email notification when either a Contact these Businesses lead or an RFP is submitted. NOTE: If you wish to approve web leads prior to consumers contacting your members, enable the Require Staff Approval Before Delivery option under Setup->Directory Control Panel. Click Web Leads in the Task List. Click the Subject/Message to view details of the Web Lead. If you wish to view the contacts to whom the lead is to be sent, click the Show Recipients button. If this message should not be delivered to members, click Reject. The message will not be sent to members. NOTE: No notice is sent to the sender of your rejection. eReferral is designed to accomplish two tasks with a single entry - getting desired member information to a consumer while letting the member know that they’ve been referred. eReferrals allow you to give your members' information to consumers when they ask for it. At the same time you can choose to send that consumer's information to your members giving them a lead. Specify the eMail From: Select Use email address for the logged in chamber representative to specify that the from address should be the staff member logged in; or Use the email address and enter an email address to be used each time an eReferral is sent. Email to referral recipients: Customize the default subject and message for the email being sent to your members. Enable Include carbon copy to sender. if you wish a copy of the eReferral to be sent to the sender. Email to potential customer: Customize the default subject and message for the email being sent to the consumer. Lead Sources: Select the desired lead source. Lead Sources allow you to categorize where your eReferrals were initiated from. The Lead Source is included in the information emailed to your members and is also recorded on their Communication history. It is also on the Referral Report which may be viewed in the Member Information Center (MIC). To add additional lead sources, click the edit list. Click Send and Record Referral. The referral will be sent to members, and to the customer. When selecting to record an eReferral only, you can log the referral without notifying the member. This is useful when you wish to track business cards, or brochures of a member that you have handed out. Enter in as much or as little Potential Customer information as desired. If logging for business cards or brochures, you may leave this area blank. The ereferral will be logged on the member(s) communication history for reference. Push Notifications are a fast and efficient way to communicate with your members. They can help you send real-time updates and reminders that get your members to regularly engage with you, even if they’re not aware of it. You can target the right members by selecting to send to just individual groups, or to all of your members. NOTE: Push Notifications are received by those Reps who have downloaded the MemberPlus App. See MemberPlus: An App For Your Members for more information. Click Communication in the left-hand navigation panel. Click Push Notification in the Other Communication Tools section. Click All users in your association to send the notification to all reps in your association. Enter your message in the Message to push out text box. All representatives, who have downloaded the MemberPlus App, will receive the notification. See View Notifications in the MemberPlus App for details. Click Manage Blog in the Other Communication Tools section. On the Blog Tool Home tab, click the Create New Blog button. Enter a Name (required). This may be displayed on your website. Enter a Title for your post. This field is required. Recommended max characters ~50-60 for best SEO results. Enter your Post. You may use all of the standard rich text editor functions, including adding images and links. Enter the Date displayed on the post. This will provide your readers an understanding of how current the post is. Select a Category(ies) for this blog. Categories help organize your blog, and make it easy for readers to find what they are looking for. Click the edit link to add/edit categories. Author: Your name will automatically be entered here but feel free to put in the name of your guest blogger if you have one. The author's name shows next to the post title. The author name will be displayed on the blog posts. Allow/view comments: If Allow/View Comments is selected, visitors to the post will have the option to add their comments to your post and see comments by others that are marked as Approved. Require name and email address when submitting a comment (if not checked, anonymous comments are allowed): Enable this option if you would like visitors to provide name and email address when submitting a comment. NOTE: The email address will not be displayed in the blog, but will be available to your staff in the back-office. Require comment approval by staff: Enable this option if comments must be approved by your staff prior to being published on your page. If comment approval is required, an email address must be listed to receive the comment notifications on the Share Blog tab. If you are not too concerned about negative feedback on a post, we recommend allowing immediate display simply to encourage quick and healthy conversations on your post. Allow likes: Select this option if you wish to allow visitors to like posts in the blog. Published: To display this post in the blog, select Published. NOTE: The post will only be displayed if the blog itself has been made active. Click Close. NOTE: After the post is saved, you can edit the post to add a Featured Image. The image will display on the blog page where each post displays with a summary and a link to read the full article. See Add a Featured Image to Your Post for instruction. Blogging is just not about plain text written on a page; a good article is the combination of text, images, and other various multi-media elements like videos, charts, slides, etc. Remember: A picture is worth a thousand words. Once you have created and saved a post, you can edit the post to add a Featured Image. The featured image will display on the blog page where each post displays with a summary and a link to read the full article. The image uploaded here will be cropped to fit into a square location which is consistent with the way other locations in the public pages display and use the featured image. Click the Home tab, and click the blog that you wish to add a featured image to. The Posts tab will display. Click the icon next to the post to which you wish to add a featured image. In the Featured Image section, click the icon. Select a previously uploaded file from the list, or click Upload to select a new file. Crop the image as needed, then click Crop & Save. Once you have created your blog, you may share it in a variety of ways: send a link to the blog to interested parties; add the link to your web-page as a new page; add a widget to your web-page. On the Blog Tool Home tab, click the blog that you wish to share. Click the Share Blog tab. Blog Status: Set the blog to Active. Setting the blog to active makes the blog publicly available if the URL is known and accessed by the public. You would still need to add the blog to your website as a separate step in order to make it easily available. Include Index on blog page: The blog page can display an index of the blogs posts by date and/or by category. If very few posts exists, the date index may not be necessary. The category index is helpful for visitors to easily locate the content they might be looking for. Index by date: Index by date will display the year and then the quantity of posts in that year. Then it will display the month followed by the quantity of posts in that month. Visitors will be able to click the year or click the month to filter the blog results to those posts only. Index by category: Index by category will display only those category names where posts are assigned with a quantity besides the category name. Visitors will be able to click the category name to filter the blog results to those posts only. Number of posts to include on blog landing page: This option allows you to limit the number of posts displayed on you blog - visitors can scroll to view additional posts. (0 = unlimited posts with 'infinite scrolling'). Email comment notifications to: If you have configured the blog to require staff approval for visitor posts, enter the email address(es) of staff who should receive notification. You may enter multiple email addresses separated by commas. By default, the email address of the person that created the blog will be listed automatically. Send notification only if comment requires approval: Select this option if you only wish to be notified of comments added that require approval. If deselected, a notification will be sent each time a comment is added to the blog. Show description on blog landing page: Select this option if you wish the description of the blog to be displayed on the blog landing page. Click Save to save the advanced settings. Copy and email this link to interested parties: Copy and email the link that is listed here into the body of your email and send it to those you'd like to invite to read your blog. Add this link to your website as a new page: For SmartCMS Users, nothing needs to be done on the Share Blog tab. A web module is available to you. For other CMS users, copy the link that is displayed here, when in your CMS software, choose the selection for adding a link to your menu. From the Widgets drop-down list, select Blog. Select from the list of available blogs. (Note: only active blogs will be displayed in the list). Make any desired changes to the default options. Click Generate. The HTML code will be displayed in the window at the bottom of the screen. Use this code to add the blog to your web-site. When it comes to your blog, you should make regular posts on a consistent basis. Your regular blog readers will be looking for new posts from you, and when they don’t find them, will assume that your blog is not that important to you and will quickly lose interest. Posting consistency also applies to the specific days of the week when you publish new content. If you start out posting every Monday and Thursday, you need to continue to post every Monday and Thursday. On the Blog Tool Home tab, click the blog that you wish to post to. The Posts tab will display. NOTE: You are adding a post to an existing blog NOT creating a new blog. Click the New Post button. Click Save. NOTE: After the post is saved, you can edit the post to add a Featured Image. The image will display on the blog page where each post displays with a summary and a link to read the full article. See Add a Featured Image to Your Post for instruction. On the Blog Tool Home tab, you can click into the Unread Comments or Total Comments numbered link. Comments that are submitted will immediately display on the Comments tab with a dark, bold color for their title, which indicates it is Unread. After the comment has been clicked (indicating someone has read the comment) then the comment will change to the standard black font, which indicates it is Read. Read status is marked no matter which staff person clicks the title of the comment; it is not particular to a certain staff login. To view the details of a comment, click into the comment. The content of the comments, along with the name of the visitor who posted the comment will display. If you have configured your posts to require approval of comments made, you will be able to view and approve (or decline) the posts added by visitors. Staff members identified as Email comment notifications to: in the Advanced Options on the Share Blog tab will receive the notification,shown below, when comments have been entered. Posts will not be displayed on your blog until they have been approved. On the Blog Tool Home tab, click the blog for which you wish to review comments. Click the Comments tab. Comments from all posts of this blog will appear on the Comments tab. Use the filters to view exactly what you are looking for. To view further details of the comment, click into the comment. The content of the comments, along with the name of the visitor who posted the comment will display. Click the in the Actions column to approve the comment. On the Blog Tool Home tab, click the blog for which you wish to delete comments. Click the in the Actions column to delete a comment. 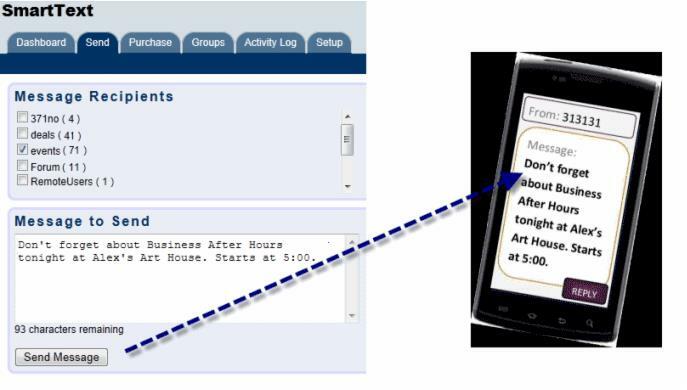 SmartText, group text messaging, available right within your ChamberMaster database allows you to contact your members, community, or other individuals via group text messaging. Use it to promote your own events or gain non-dues revenue by offering the service to your members at a fee. By setting up different recipients lists you can offer a group for text deals. These groups can be promoted by you and your members to build the list. Your members would pay a set amount to have their deal promoted via text message to this group. The set amount would need to be enough to cover the cost of using the SmartText feature and administrative time. These text deals would be a good way to promote a percentage off or special offer. One example would be that once an association has gotten numerous people who opt-in to the text group*, then they can allow members to purchase this media as an outlet to be able to contact those members via text/SMS messaging through your association. As a non-dues revenue source, an association can offer this to members at a cost to the member however, this would be less expensive than having their own SMS service and would allow through your association, many more opt-in clients (as well as public) that would like to receive text messages with offers and discounts. This feature eliminates the need for a member to have their own SMS push/notification feature and is at less costly than an association could do on your own. The member would see a turn of profit on people using the discount and this would show them the benefit of the price they paid as a member benefit for them. SmartText has great capabilities and is easy-to-use. SmartText is currently limited to subscribers on US mobile phone carriers. One credit equals one text – either a received text or a sent text. One credit currently costs .05 cents. Credits do not have an expiration date and are non-refundable. 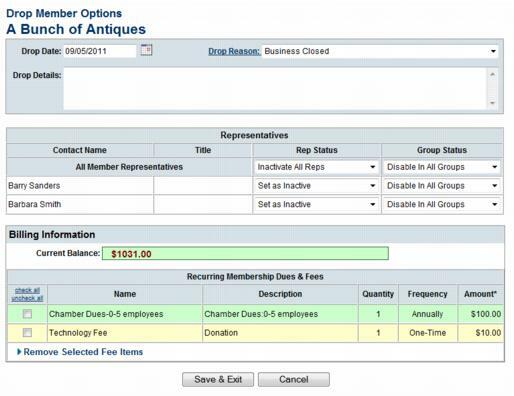 Purchase additional credits right in your ChamberMaster database under SmartText->Purchase tab. When someone subscribes to your list, that will cost 2 credits = 1 for the incoming request and 1 for the automatic thank-you reply. So, one subscription will cost .10 cents at the current rate. Sending a single group text to 100 subscribers would cost $5.00. Sending a single group text to 500 subscribers would cost $25.00. Sending a single group text to 1000 subscribers would cost $50.00. You can purchase additional Smart Text credits directly in your database. Click Communications in the left hand navigation panel. Click Smart Text in the Other Communication Tools section. In the I'd like to purchase text-box, enter the number of credits you would like to purchase. Each message credit is $.05. Credits do not have an expiration date and are non-refundable. Enter Payment Information and click Submit Payment. You can also buy additional credits by clicking Buy in the statistics section of the SmartText Dashboard. This list is opt-in only; Subscribers must opt in to be included in your subscriber groups. Lists of phone numbers may not be imported. 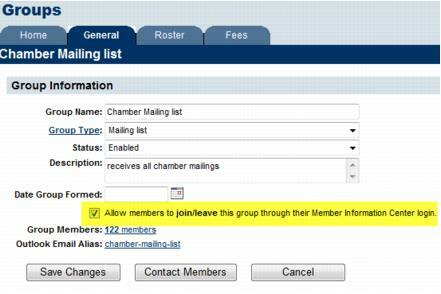 Existing mobile phone numbers in ChamberMaster will not auto-populate your subscriber list. In order to have subscribers opt in, you must create a keyword – either a shared keyword (no charge) or a custom keyword ($25/month). NOTE: Practice and testing can happen without a keyword. If you wish to have different lists of subscribers (event list, board member group etc), you must create a group and have your subscribers opt in to each group. You must setup these groups prior to advertising your opt-in information to the public so that subscribers are placed in the proper groups. Subscribers may not be moved from one group to another. Your ChamberMaster/MemberZone system is integrated with a leading provider of SMS/text services. We receive all text messages sent to 313131 (a short-code) that start with our keyword notify, or your own custom keyword. When our system receives the message we log it with your account by looking at the first 1 or 2 words of the message. If you use a custom keyword then the message will start with your keyword and we will match it up directly. Otherwise if you use a shared keyword we look for it after the word notify. When using a shared Keyword subscribers will text notify greenacres to 313131 to subscribe. When using a custom keyword subscribers will text greenacres to 313131 to subscribe. Basically a custom keyword means your prospective subscribers have one less word to remember and enter, which will cut down on mistakes and lead to more subscribers. The difference is subtle but if you are putting it on a billboard, newsletter, etc. then the shorter message typically results in more interests. Especially once you start adding other commands. E.g. "To get notified of special events or discounts please text greenacres to 313131". You can drop the custom keyword at any time and revert to a shared keyword. For example, you could use a custom keyword for a year to build your base of subscribers and then drop it if you don't get many incoming subscription requests. You will note on the Dashboard a message stating Your account isn't configured for SmartText, the integrated text messaging platform. Get started via Setup. Read the Overview and the Differences between Shared and Custom Keywords information. Enter your key word (this is required regardless of Shared or Custom selection). Click Reserve and Enable. custom keyword. The Current Keywords' section will populate with your unique SmartText information. You are ready to advertise and start receiving subscriptions to your text service! In the shared keyword example above, you would advertise that your subscribers should text Notify training to 313131. This would subscribe them to your generic list titled Subscribers without Specific Groups. A response will be sent to them, confirming the subscription and providing instructions on how to unsubscribe. If you would like different lists of subscribers (event list, board member group etc), you can create groups and have your subscribers opt in to specific groups. 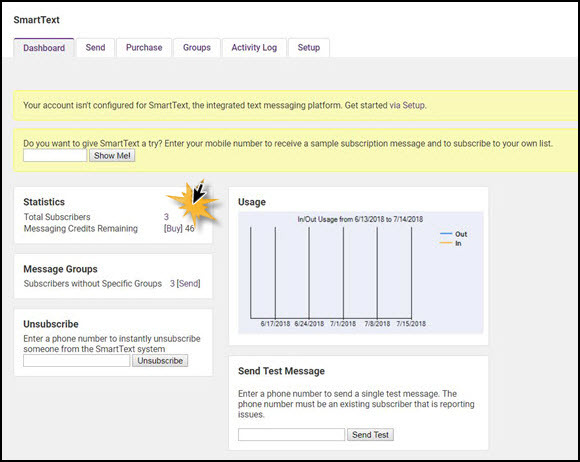 See Create Subscriber Groups for Smart Text for instructions. Best Practice is to setup these groups prior to advertising your opt-in information to the public so that subscribers are placed in the proper groups. Subscribers may not be moved from one group to another. If you would like to have different lists of subscribers (event list, board member group etc), you can create groups and have your subscribers opt into specific groups. You must setup these groups prior to advertising your opt-in information to the public so that subscribers are placed in the proper groups. Subscribers may not be moved from one group to another. Type the name for the group (board, events etc.) that will be used by the subscriber in the opt-in subscription text. Example advertisement: Text “notify training events” to 313131 when the shared keyword “training” is reserved. Type a Description for your internal purposes. You are ready to advertise and start receiving subscription to your text service for this specific group. In the shared keyword example (where the key word is "training" with a group called events, you would advertise that your subscribers should text Notify training events to 313131 This would subscribe them to your specific group titled “events”. You can view subscribers to your smart texts on the Smart Text Dashboard or on the Smart Text Groups tab. The Message Groups section will display all of your smart groups. Click the numbered link for the desired group. The mobile number subscribed and the join date will be displayed. NOTE: Names are not displayed. Click the Subscriber/Member number for the group you wish to view. The mobile number subscribed and the join date will be displayed. NOTE: Names are not displayed. Prior to going live with advertisement of your group texting ability, you will want to test the functionality of SmartText on your own. Note: 50 free credits are provided to accommodate messages such as these. Sending test messages will reduce your available credits. Type your mobile number in the Send Test Message box and click Send Test. A test message will arrive on your mobile device. A sample text message will arrive on your mobile device. This thank you subscription message is the message all your subscribers will receive. The association name listed in this message is pulling from the name listed under Setup>Organization Information. You will also notice your Dashboard Statistics shows an additional Subscriber and one less credit than before. Note: 50 free credits were given when SmartText became available. You will also notice, if you click on the Send tab, that you belong to the subscriber list Subscribers without Specific Groups. You are officially part of the list of subscribers that would receive a message if this group “Subscribers without Specific Groups” is selected as a recipient. Click Communications in the left hand menu. Click to select the group(s) in the Message Recipients section that should receive your group message. Web Address Shortener (optional): For people that have a SmartPhone with a web-browser you can insert a link into the message. A full website address will take too many characters so use the Web Address Shortener to produce a compact URL. Type your full website URL, click Shorten and Insert. The short version will be inserted within your message. Type your outgoing text message in the Message to Send box. NOTE: Messages are limited (universally) to 160 characters in length. The Message to Send box will not allow more than 160 characters to be entered. Click Send Message. NOTE: When sending a message, if not enough credits are available, a message will appear indicating how many credits are needed in order to complete the current message delivery. Incoming subscriptions and auto-replies are allowed to create a negative balance. But the next message that is sent will require you to purchase additional credits in order to complete the current message delivery. NOTE: When sending a message, if you do not have enough credits, a message will appear indicating how many credits are needed in order to complete the current message delivery. Incoming subscriptions and auto-replies are allowed to create a negative balance. But the next message that is sent will require you to purchase additional credits in order to complete the current message delivery. See Purchase Additional Credits for instructions on buying additional credits. In the Statistics section of the Dashboard, Messaging Credits Remaining will display the number of available credits. Click the Buy link to purchase additional credits. See Purchase Additional Credits for instructions. Where do I purchase additional credits? Purchase additional credits right in your ChamberMaster database on the SmartText Purchases tab. See Purchase Additional Credits for instructions. What is the difference between a shared and custom keyword? Text notify greenacres to 313131 to subscribe. A custom keyword means you would tell subscribers:Text greenacres to 313131 to subscribe. Basically a custom keyword means your prospective subscribers have one less word to remember and enter, which will cut down on mistakes and lead to more subscribers. The difference is subtle but if you are putting it on a billboard, newsletter, etc. then the shorter message typically results in more interests. Especially once you start adding other commands. E.g. "To get notified of special events or discounts please text greenacres to 313131". You can drop the custom keyword at any time and revert to a shared keyword. For example, you could use a custom keyword for a year to build your base of subscribers and then drop it if you don't get many incoming subscription requests..
To unsubscribe, subscribers will text “Stop notify shared keyword;” if you have reserved a shared keyword or “Stop custom keyword"; if you have reserved a custom keyword. NOTE: Unsubscribing will unsubscribe from all groups. See Unsubscribe from SmartText for further instructions. What if I don’t have enough credits? When sending a message, if not enough credits are available, a message will appear indicating how many credits are needed in order to complete the current message delivery. Incoming subscriptions and auto-replies are allowed to create a negative balance. But the next message that is sent will require you to purchase additional credits in order to complete the current message delivery. See Purchase Additional Credits for instructions on buying additional credits. Capitalization does not matter - - incoming subscription texts can be upper or lower case and it will arrive at the appropriate chamber and their group; it is not case-sensitive. What happens if someone subscribed to a group more than once? If this happens, it is not detrimental – the subscriber will remain subscribed to the list and will not be duplicated. The only issue that appears is that the 2 auto-confirmation text will not specify the group they subscribed to, one will). How can I use SmartText to generate non-dues revenue? By setting up different recipients lists you can offer a group for text deals. These groups can be promoted by you and your members to build the list. Your members would pay a set amount to have their deal promoted via text message to this group. The set amount would need to be enough to cover the cost of using the SmartText feature and administrative time. These text deals would be a good way to promote a percentage off or special offer. One example would be that once an association has gotten numerous people who opt-in to the text group*, then they can allow members to purchase this media as an outlet to be able to contact those members via text/SMS messaging through your association. As a non-dues revenue source, an association can offer this to members at a cost to the member however, this would be less expensive than having their own SMS service and would allow through your association, many more opt-in clients (as well as public) that would like to receive text messages with offers and discounts. This feature eliminates the need for a member to have their own SMS push/notification feature and is at less costly than an association could do on your own. The member would see a turn of profit on people using the discount and this would show them the benefit of the price they paid as a member benefit for them. Public and clients who wish to receive SMS/Text Messages from your association will need to opt into the group. Staff cannot add mobile phone numbers directly under privacy laws. 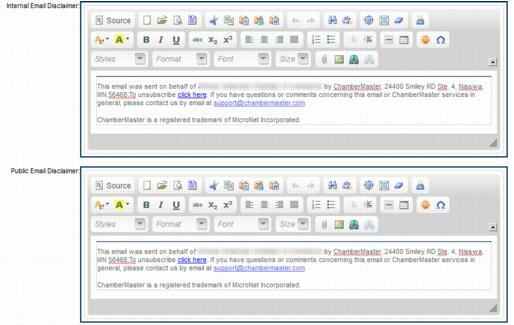 To help you identify email that comes from ChamberMaster, find the email sample below that matches your email message. These email samples are legitimate emails generated from ChamberMaster features based on activity by consumers and chamber staff. If you have further questions or concerns, please don’t hesitate to contact ChamberMaster Customer support. 1-800-825-9171. Content of the message: The comments of the message will vary based on what is written by consumers visiting the web site. Extra notes: Please note that the member’s email address may not be viewed by the consumer. The email is sent using a ChamberMaster form filled in by the consumer visiting the web site; the email address of the member is not displayed. Some consumers have chosen to abuse this feature on the web site that was originally designed to ask questions of the member. If this is a concern or problem, the ability to contact the members may be removed from the web site. Simply remove the email address in the Web Contact Information area on the Web tab of the member’s record. Where the message comes from: This email message is received by a member when chamber staff send an invitation from the Events module. Invitation content may be modified as desired, including the subject line, using the Add Invitations button on the Guest List tab in Events. The included links are determined by selections made within the Events module. Content of the message: The content and subject line of the message varies based on the desires of the chamber staff. When creating an event invitation, a sample invitation is automatically generated but may be modified as desired. 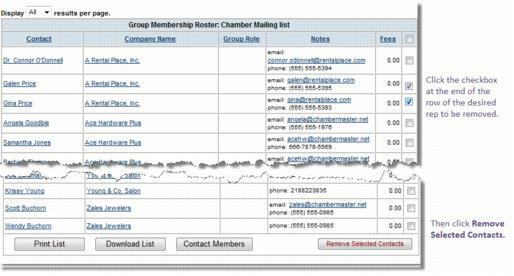 Where the message comes from: This email message is received by a member when chamber staff select Distribute General Leads within the Lead Management screen in the Info Request module. Content of the message: The content of the message varies based on the lead information recorded in Info Request. 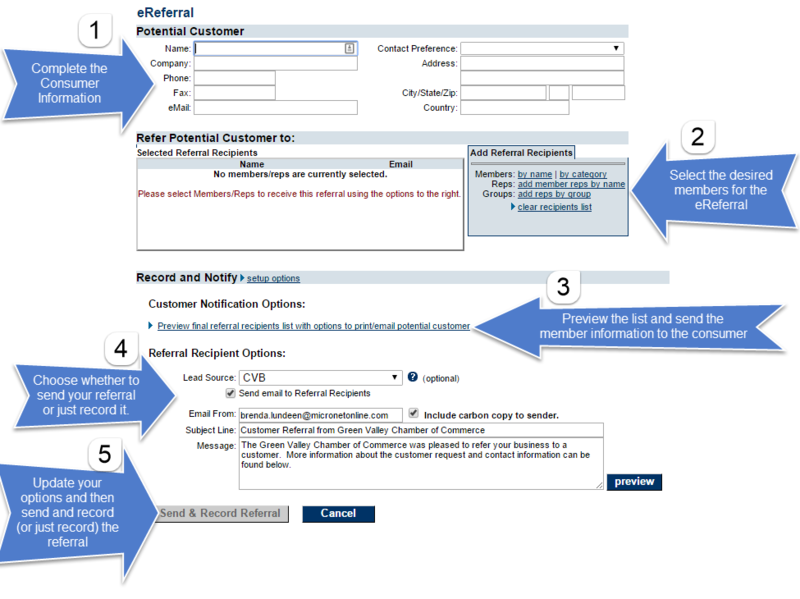 The consumer information may either be recorded by a chamber staff person through Enter Information Request or may have been input by a consumer if using the Info Request selection on the chamber’s public web site. 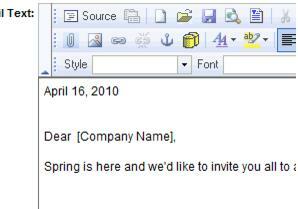 The subject line is a field that may be modified by chamber staff right before sending the leads. Where the message comes from: This email message is received by the chamber when a consumer clicks Contact Us on the chamber’s public web site. This link is a module that is available as a link on your chamber’s public web site. Content of the message: The comments of the message will vary based on what is written by consumers visiting the web site. 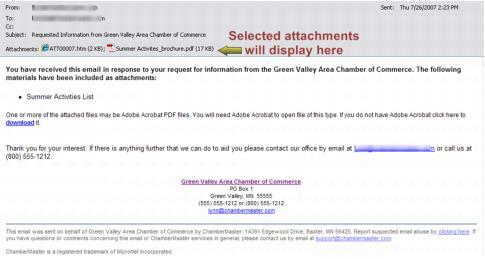 Extra notes: The email is sent using a ChamberMaster form filled in by the consumer visiting the web site; the email address of the chamber is not displayed. Where the message comes from: This email message is received by a consumer when chamber staff complete an Info Request form and select that an email version of a publication or brochure be sent to the consumer. Consumers may also generate this same result when selecting to receive an email version of a publication using the Info Request module on the chamber’s public web site. Content of the message: The content of the message remains basically the same but the attached documents vary based on the selections made on the Info Request form. Where the message comes from: This email message is received by a consumer when another consumer selects to email a Hot Deal to another consumer. Content of the message: The content of this message remains basically the same but the name of the Hot Deal will vary. Where the message comes from: This email message is received by a consumer when another consumer selects to email a job posting to another consumer. Content of the message: The content of this message remains basically the same but the name of the job title will vary. Who is able to view the attachment that comes when I send myself a carbon copy? Why do some of my email messages not make it through to the recipient? Are there any systems in place to help ensure the delivery of my emails? How can we ensure that our members are not spammed through the Contact Us link? Why do the links inside my email not open for me or my members? How do I create a signature block to use when sending communication? How can I easily provide referrals AND notify my members when I've given out information referring them? How do I send a letter/email to my members with their login name and password included automatically? Why do my mailing labels get cut off or are not aligned correctly? How do I manage my mailing lists? How do I remove the headers and footers that print on my letters and reports? ↑ Note: These document storage folders are only available for those with Plus edition or greater. ↑ File types allowed: jpg, jpeg, gif, png, svg, txt, pdf, odp, ods, odt, rtf, doc, docx, pub, xls, xlsx, ppt, pptx, ogv, mp4, webm, ogg, mp3, wav. up to 50 MB in size.